The DrayTek VigorAP 902 is a wireless access point which can be operated in standalone or centrally managed/monitored mode (with the use of a central DrayTek management product - see later). The VigorAP 902 is a high specification professional access point providing reliable and flexible coverage to all manner of applications. A vast array of security and management features helps the AP to improve and protect flexibility and integrity of your wireless LAN. The VigorAP 902 is ideal for adding wireless connectivity to an existing LAN, or for expanding the range of an existing wireless LAN by using the WDS repeater features. The VigorAP 902 supports simultaneous operation of the common 2.4Ghz band and faster 5Ghz band. The 5Ghz band is far less congested so if your PCs or other devices support the 5Ghz band, you can use that. The 5Ghz band is used for 802.11ac (or optionally 802.11n and 802.11a). The VigorAP 902 operates both bands at the same time, allowing your devices to use either band and each has its own bandwidth so overall wireless capacity is also increased. The 5Ghz interface supports the full range of extended domestic 5Ghz channels, thank to its support for DFS/TPC; you can select all 5Ghz channels up to channel 140, as opposed to just the 4 'Band A-Lower' channels (which provides only two non-overlapping channels). It has support for Band Steering which can be configured to guide clients that are able to connect to 5GHz wireless networks onto this band instead of the more congested 2.4GHz band, which results in client connections being shared between the two frequencies more evenly, potentially increasing the number of wireless clients that can be connected to each Vigor Access Point. The VigorAP 902 has five wired Ethernet ports (separated into two distinct separated LANs). LAN A and LAN B can be fed separately and in turn broadcast on independent and isolated SSIDs. As the ports are all Gigabit, you can be sure that the AP is fed at the maximum speed in order to fully satisfy the full speed of both 2.4GHz and 5Ghz bands simultaneously. The four ports on LAN A are particularly of use if you are using the AP as a wireless bridge as you can then connect wired PCs or devices to it. LAN Port 3 on LAN-A is also used as the PoE input if you're powering the AP by PoE. 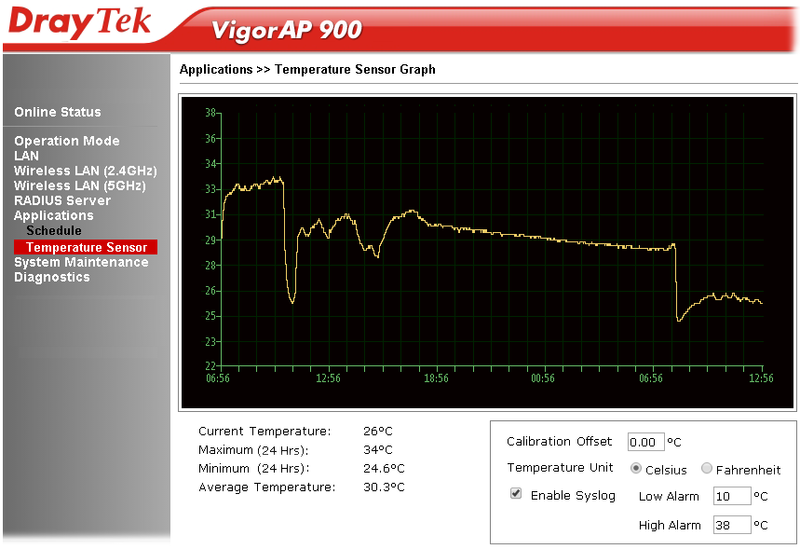 The VigorAP 902 can operate in standalone autonomous mode, but can also form part of a centrally managed wireless installation by adding a compatible DrayTek wireless controller (a Vigor2860, 2925, 2952 or 3220). This enables you to centrally control, manage and administer multiple AP devices installed around your building/campus. Management also enables efficient usage of your wireless access point through load-balancing, whereby wireless clients are distributed across several access points to reduce congestion. The VigorAP 902 features multiple levels of wireless security. Encryption using WPA2 (802.11i) is available and you can also use the access control list (ACL) to specify the hardware addresses of clients which are permitted to connect (by MAC hardware address). Any unauthorised hardware is refused access. 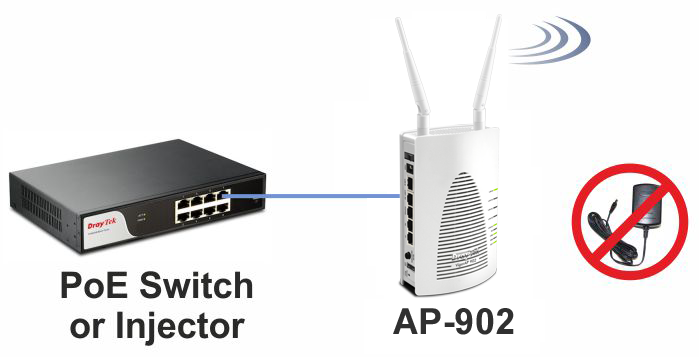 For additional user authentication, you can activate 802.1x RADIUS (Remote Authentication Dial-in User Service) which allows you to centrally manage and store user names and passwords either within the AP setup itself (thus not needing any external server) on an external radius server which can permit time limited, temporary or continuous access to your clients as required. The VigorAP 902 supports the 802.1q VLAN protocol so that if it is connected to an 802.1q enabled LAN, it can split tagged data (whether it's different subnets or intended for different users) and broadcast each on its own SSID. This means, for example, that your guest WiFi access is provided on a separate isolated SSID with no access to your company data. As your VigorAP 902 unit(s) will be distributed around your building, it's an ideal opportunity to also gather environmental information about those locations. 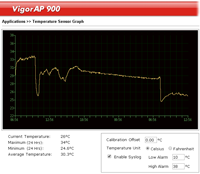 By the addtition of an optional USB temperature sensor, your VigorAP 902 can report real-time local temperature information, show the previous 24 hour's chart and also set high/low alarms to alert/log if the temperature falls above or below your set levels. This facility is ideal for detecting if any part of your building is over or under-heated or if heating/cooling has been left on overnight and therefore helping to make more efficient use of your heating or cooling energy consumption, potentially saving cost. The VigorAP 902's USB interface can instead connect to a regular printer. That printer is then accessible from any wireless or wired PC which connects to the VigorAP 902, or a PC anywhere else on the network. This is ideal to provide printer access to wireless laptops but could also be used for installing a printer elsewhere in your home/office by using a pair of VigorAP 902s to make a bridge. Wireless Security (encryption) is important to protect your data (privacy) but also to prevent unauthorised people from accessing your network or your Internet connection. The WPS system means that instead of having to create and enter long encryption keys, you can activate WPS registration. To activate, you press and hold the WPS button, then activate WPS on your wireless device; the two devices then automatically exchange encryption keys. WPS can be disabled if not required or for more security. The same button on the VigorAP 902 also serves as a physical on/off switch for the Wireless LAN if you wish to quickly disable it at any time, whilst still leaving your wired ports active. For further details of the wireless modes available on DrayTek VigorAP Access Points, click here. The VigorAP 902 supports PoE (Standard IEEE 802.3af Power over Ethernet) as standard (built-in) so if the AP is connected to a PoE-enabled Ethernet switch or PoE injector, you don't need any local power to the unit (power supply) - the VigorAP 902 will take its power from the Ethernet cable. The VigorAP 902 supports Gigabit PoE (if you have a Gigabit PoE switch/injector) such as our VigorSwitch P2261 or P1090 models (or any other 802.3af device). PoE is ideal for situations where you do not have mains power available in the exact location where you want to install the VigorAP 902 or just for general aesthetic neatness, perhaps where the AP is installed somewhere prominent. The VigorAP 902 is also supplied with an AC/DC mains PSU for installations where you are not using PoE. The VigorAP 902 can support two completely independent LANs. Each is connected via its own independent RJ45 Ethernet interface. There are Ethernet RJ45 interfaces for LAN A (4 ports) and LAN B (one port). These networks remain completely isolated from each other. Each LAN can be assigned its own separate Wireless SSID so they remain separated even on the Wireless LAN. This is the equivalent of having two completely separate access points and ideal for public and private networks in the same location or wireless LANs for two separate companies. Having two physical LAN interfaces provides a much simpler alternative to using tagged VLANs and/or a Radius server for authentication. It is also much easier/quicker to set up (that said, the AP can also support tagged VLANs and Radius).